When actors and technicians from the Omega Film Company are abducted and held to ransom in Colombia by a merciless junta overlord, it falls to some familiar faces to stop a near tragedy. Mac is back. Ex-SAS captain Eli ‘Mac’ Murray and his wife, former Israeli Army Captain Sarah are plunged into an all-too-familiar world of murder, abduction and international plots. When Diego Contrero Moretta requests payment for the return of the captured film makers, Mac and Sarah become the captives’ only chance of making it out alive. Crisis in Colombia follows on from Bryan Marlowe’s thrilling novels Recalled to Arms and Leaving Mercy to Heaven in which the couple had to fight a fanatical terrorist group in Africa and the Middle East. Drawing on years of experience with the Royal Air Force, police, diplomatic service and as a newspaper columnist, the author weaves a new tale of international proportions in which Mac and Sarah find themselves battling both time and the unrelenting demands of Moretta to save the innocent abductees. 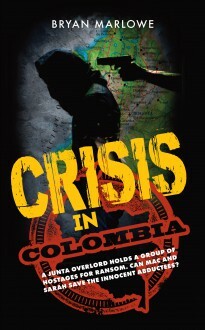 Crisis in Colombia is an action-packed thriller featuring a deadly race across the globe against a determined captor with several tricks up his sleeve.